FAU’s College of Business offers courses at both the undergraduate and graduate levels at campuses across South Florida as well as online. Building on its rich tradition as a teaching and research university, the College of Business hosts six departments with a variety of interdisciplinary and professional development programs. 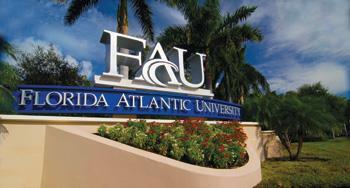 FAU’s first and largest campus sits on more than 850 acres just east of I-95. The campus features everything you expect from a modern university including state-of-the-art labs and classrooms, suite-style housing for students plus athletic and recreational facilities. It is also home to the A.D. Henderson University School, FAU High School, FAU Research Park and the nation’s largest Lifelong Learning Society. The Dania Beach facility is home to ocean engineering research and technology development in the areas of acoustics, marine vehicles, hydrodynamics and physical oceanography, marine materials and nanocomposites. Dania Beach builds on five decades of excellence at FAU as home to one of the nation's first ocean engineering programs. 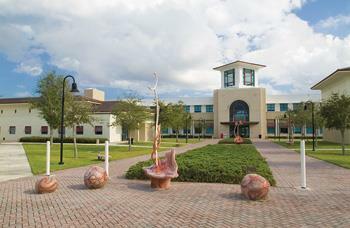 As FAU’s second largest campus, the Davie campus offers more than 40 “2+2” programs in partnership with Broward Community College, with which it shares a campus. The campus hosts the innovative Teaching & Leadership Center and is the base of operations for FAU’s Everglades research and restoration efforts in partnership with the U.S. Geological Survey. 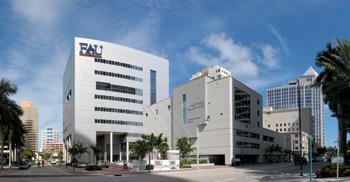 Located in downtown Fort Lauderdale, the campus is home to a mix of professional and design-oriented programs including architecture, business, computer animation, graphic design, public administration and urban planning. FAU's Harbor Branch Oceanographic Institute (HBOI) is dedicated to exploring the world's oceans and integrating the science and technology of the sea with the needs of humankind. As a base of operations for a host of research and academic programs -- such as coral reef and estuary studies, marine mammal rescue and rehabilitation, semester-at-sea programs and a variety of research positions and internships -- undergraduate students, graduate students and faculty find HBOI's high-tech facilities and dynamic environment perfect for their varied pursuits. 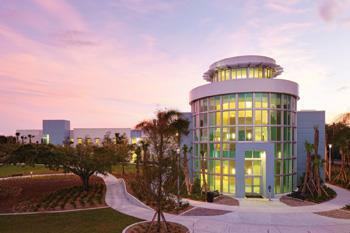 The John D. MacArthur Campus at Jupiter offers nearly 1,500 students coursework in programs from the colleges of Arts and Letters, Design and Social Inquiry, Education, and Science. It is home to the Harriet L. Wilkes Honors College -- which provides 300 students with a live-in, all-honors educational experience -- as well as the Center for Environmental Studies, the Hibel Museum of Art and research facilities for two of the world's leading research organizations, the Max Planck Florida Institute for Neuroscience and Scripps Florida, a division of The Scripps Research Institute. Just four miles from the beach, students at FAU Jupiter enjoy the resources of a large research university and the advantages of a small campus setting.